Journeyman PIF'ed a Simpson G3 shedder a while ago in Pure hair. My favorite hair and handle hands down, was thankful for his generosity. The intent was to nurse the knot through it's useful life then replace it with something else interesting. The brush ended up picking a fight with the tile floor a few weeks back, I'm a clutz sometimes, and lost in the fisticuffs. Great handle! I love mine. (04-08-2018, 07:50 AM)German Wrote: Great handle! I love mine. I covet that brush whenever I see a picture. If you ever decide to part with it, please offer it to me! The specs look pretty close, since I’m assuming that the 24 mm was meant for a set knot. It is interesting that the pre-set knot is that much smaller. I’d replace it with a Shavemac pure knot, as that’s one of my favorite badger hairs now. I like a 1:2 ratio. Only has modest backbone, but the pure hair gives it a nice textured feel on the face. (04-10-2018, 06:57 PM)Journeyman Wrote: The specs look pretty close, since I’m assuming that the 24 mm was meant for a set knot. It is interesting that the pre-set knot is that much smaller. I’d replace it with a Shavemac pure knot, as that’s one of my favorite badger hairs now. I like a 1:2 ratio. Only has modest backbone, but the pure hair gives it a nice textured feel on the face. Hi Journeyman, thank you for responding. 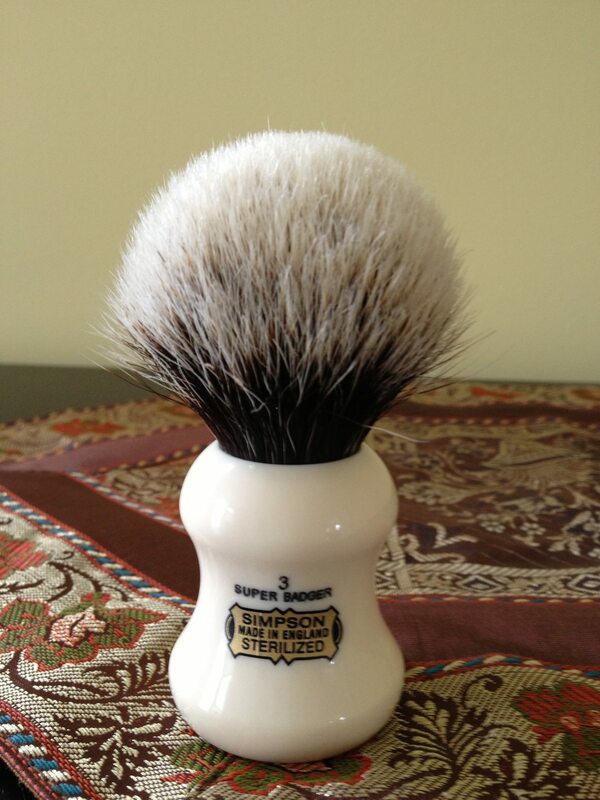 I have shavemac in Pure and agree it is a fine brush, in fact I have two of them now! Been pondering how to respect your PIF with another knot. Thought a shavemac Silvertip 2-Band might do the Eagle handle justice and make up for my negligence. Not sure about what size, but I'm sure Bernd could provide suitable advise there. Would appreciate your thoughts and opinion if you have time. BTW just picked up a Eagle G1 for fun. Great little brush. (04-07-2018, 03:31 PM)old school Wrote: Journeyman PIF'ed a Simpson G3 shedder a while ago in Pure hair. My favorite hair and handle hands down, was thankful for his generosity. The intent was to nurse the knot through it's useful life then replace it with something else interesting. The brush ended up picking a fight with the tile floor a few weeks back, I'm a clutz sometimes, and lost in the fisticuffs. I love the feel of the Eagle 3 handle--and Simpson's Pure is very nice as well (although greatly underrated, I think.) What you discovered is typical as plug diameters are often smaller than what I'll call the knot's effective diameter. If you measure the knot at 10 to (maybe) 15mm above the base, you will probably get a reading closer to--or perhaps slightly larger than--the socket diameter. As to the knot, you can always rough-up the base with a piece of medium grit sandpaper and re-glue with a small amount of 5-minute epoxy or, you can always send it back and ask Mark to have his people create a new knot for you. 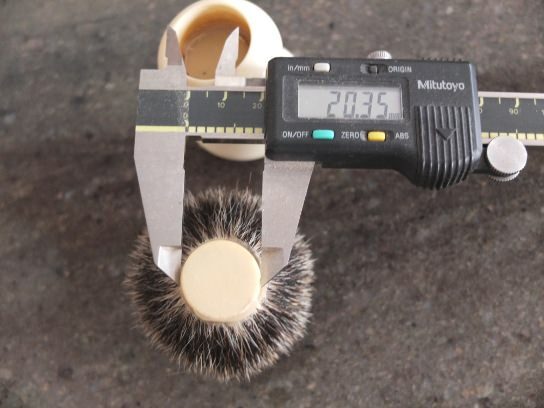 By the same token, if you decide on a Shavemac knot, you might consider ordering a 22mm and if you do, it might not hurt to let Bernd know that it needs to fit a 24mm socket. I mention that because Bernd, being the gentleman he is, might send you a knot larger than what you ordered. Either way, you've got a great brush. It depends on how much backbone you want. I enjoy the pure knots with less backbone because the coarser hairs provide tactile feedback that I enjoy. A 3-band silvertip with the same backbone would be too soft and floppy for me. A Shavemac 2 band would be somewhere in between with a 1:2 ratio. More backbone than a pure or 3-band silvertip. Much softer than the pure but not as much as the 3 band. I’ve had the Shavemac 2-band silvertip at a ratio of 26x46, and it still lathered like a dream and bloomed. Scrubby backbone and soft. That would be a smaller knot on the Eagle, so I’d try a loft somewhere around 44-45mm. Definitely ask Bernd his opinon. He’s the true expert. The 2-Band sounds interesting. Next will be to clean up the socket to see what depth I'll be working with. Thank you. (04-14-2018, 09:38 PM)old school Wrote: The 2-Band sounds interesting. Next will be to clean up the socket to see what depth I'll be working with. Thank you. I’m very much a two band user, so my opinion is that you should put a two band knot in it. Bernd’s two band silvertip knots are excellent and would be a great choice IMHO. Should you go that route and be displeased, let me know. I’ll buy it, as Georg is unlikely to part with his soon. ? Ok, Bulb or Fan? Just kidding, but curious anyway. Have you had an Elite Razor Manchurian? Where does the shavemac Slivertip 2-Band compare? (04-15-2018, 01:17 PM)old school Wrote: Ok, glad to know you got my back, what do you want a Bulb or Fan? Just kidding, but curious anyway. I have a Shavemac 2 band (25x50) and a few Elite Manchurian knots ranging from 24 to 28. Imo the Shavemac knot has a wee bit more backbone than the Elite knots. Though, occasionally a hybrid works out. (04-15-2018, 01:48 PM)chazt Wrote: I have a Shavemac 2 band (25x50) and a few Elite Manchurian knots ranging from 24 to 28. Imo the Shavemac knot has a wee bit more backbone than the Elite knots. Well that sounds very good to me. My extremely limited reference point for 2-Band is that Elite knot which I like. (04-15-2018, 02:11 PM)MaxP Wrote: My preference? and recommendation? Of the handful of brushes on the shelf only one is bulb, but it see's plenty of face time. German's brush is quite handsome in bulb don't you think? 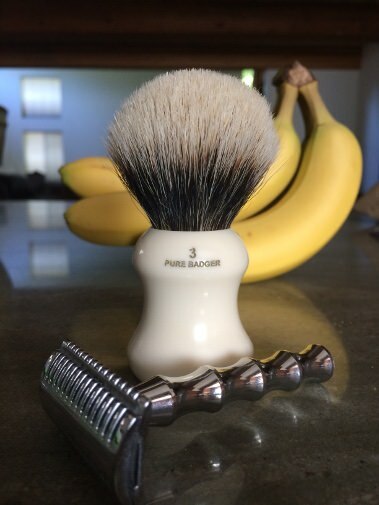 (04-11-2018, 05:37 AM)BSWoodturning Wrote: I love the feel of the Eagle 3 handle--and Simpson's Pure is very nice as well (although greatly underrated, I think.) What you discovered is typical as plug diameters are often smaller than what I'll call the knot's effective diameter. 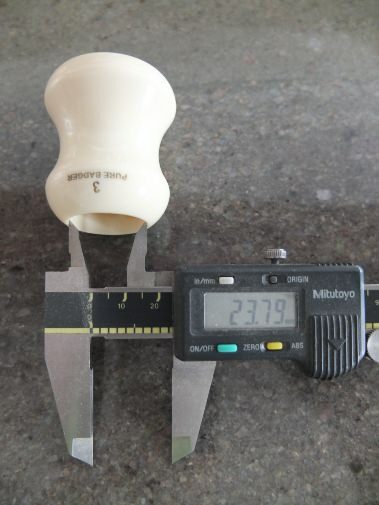 If you measure the knot at 10 to (maybe) 15mm above the base, you will probably get a reading closer to--or perhaps slightly larger than--the socket diameter. Thank you for the tips on sizing a knot. That makes sense, there's room to bloom and the handle rim won't beat up the hair on the perimeter. If a fellow can stand a bit of prickle the performance of the Simpson Pure is nice. Cleaned up the socket today, went down 15mm which removed the base of the knot but was not in native material yet. Well curiosity killed the cat so went down another 0.5mm and still in the mounting epoxy or something else (a spacer?) which I thought was interesting, and then another 0.5mm and another. The handle material is now just showing in the pilot hole, I used a Forstner bit. Called it done right there. Thank you again for your pointers, it's appreciated. (04-21-2018, 06:59 PM)old school Wrote: Cleaned up the socket today, went down 15mm which removed the base of the knot but was not in native material yet. Well curiosity killed the cat so went down another 0.5mm and still in the mounting epoxy or something else (a spacer?) which I thought was interesting, and then another 0.5mm and another. The handle material is now just showing in the pilot hole, I used a Forstner bit. Called it done right there. Curious. 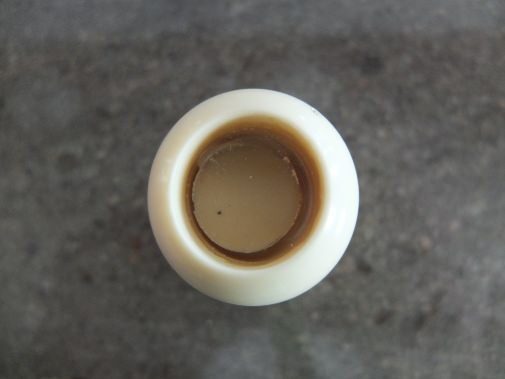 It sounds like the hole was deliberately deep and the epoxy was used both as adhesive and spacer. I typically use cork slices or coins for spacing. I don't like reading threads that never have an ending so here's the finale. Ended up installing a 22mm Maggards 2-Band knot. Mounted up and broke in it measures ~24mm at the top of the bore and ~47mm loft, delightful brush. The razor is a RazoRock SLOC, bamboo handle has one internode chopped off to lighten and shorten the handle. My regular axe is a late 50's tech so I'm used to short and light. Needed something for contrast on the knot, sorry the bananas were handy.